Note: As of January 2017, Rob left Toba to start Furious Collective, a venture production studio, with Dave Kloba. Rob and Dave were both members of the founding teams at both AvantGo and KACE. They plan to launch 3 to 5 software businesses in the next 24 months. 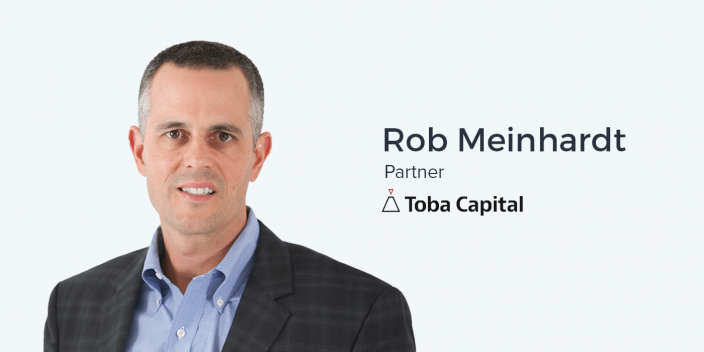 Rob Meinhardt is an advisor and investor as a partner at Toba Capital, a venture capital and private equity firm in the San Francisco Bay Area. He also sits on the board of a number of companies in his portfolio including Reach150, Transifex, SauceLabs, and FloQast. Prior to his work as a VC, Rob was on the other side of the startup world as a founder himself, launching KACE Systems Management as CEO in 2003. He spent 7 years there, growing KACE to over 400 employees and an acquisition by Dell where he spent another three years as a General Manager. Creating a culture and create a religion around your brand and product is incredibly powerful, and that goes for your team and colleagues as well as your current and potential customers. As an investor, Rob even specifically looks for customer fanaticism in the companies he invests in. That starts with the employees at the company itself. I think the only way to maintain great culture when you’re doing that is to really create what I’ll call a religion, or a fanaticism that transcends you as a founder. It’s really about the company...You create a club that people want to be a part of at the end of the day. It’s really important in marketing and retaining great people and retaining great culture. Predictability is more important than reaching or even exceeding your goals. Don’t let there be surprises. If you’re going fall short of your KPIs, or even exceed them, make sure you forecast those results appropriately. Someone in my career once fairly early on taught me that the actual results matter to a degree, but it’s almost more important that you understand where you’re going. So, if you say you’re going to have a good quarter represented by some certain number, that you actually hit that number. Or if you think you’re going to have a bad quarter and you call it early, at least it demonstrates that you understand the business. Investors especially like knowing what to expect from the companies in their portfolio. Channel that inner level of trust with your investors and board members as soon as possible. Build that bridge sooner rather than later. The most important things you can do as a marketer are not necessarily quantifiable, You don’t want to forget about the qualitative components of what you’re doing, even if there is no clear dollar-for-dollar return. What makes great marketing is personality. It’s charisma. It’s touching a nerve, and creating a religion… I think that’s what’s going to make great marketing in the future. You have different tools at your disposal but if you forget that marketing’s about a human touch point and hitting that nerve, I think you’ll never be a truly extraordinary marketer. Almost anybody with an adequate budget can learn to use the most powerful automation and marketing technology tools available. However, the effectiveness of those pieces of your marketing strategy will be dramatically multiplied with the right narrative and cult of personality around your product. Ander: So, this is a very exciting interview because I took quite the adventure down here from San Francisco to Menlo Park to interview Rob Meinhardt. Did I say your name correctly? Ander: Rob, it’s a pleasure to be here with you in your home office, which is quite amazing, made of stone here. I really like what you’ve done with this place. Rob: Thank you. Yeah, it’s a cool little vibe. We tried to make it look like something that’s been here for a couple of hundred years in the back of our yard, like it was an old shed that got a neighborhood built around it. Ander: Awesome. Well again, it’s a pleasure being here and thank you so much for taking the time to do this in your busy schedule. Ander: Rob, right now you are a partner at Toba Capital. Ander: But from my understanding – and from what Saranya, our VP of Marketing over at Instapage has told me, she previously worked underneath you – you’ve got quite the background that led you to what you’re doing right now with Toba, advising and investing in these companies. So I think the best place to start would be hearing a little bit about your story, maybe the thirty-second nutshell to how you got to where you are today. So I was sort of forced into teaching myself how to program to build a few games for myself because I couldn’t figure out why else you would want to have a computer when I was fourteen years old. Rob: That followed after college and I got involved doing some… initially for a boutique consulting firm, doing strategy and marketing consulting work for, probably right out of college, maybe twenty or thirty different companies over an eight-year period. Since then, I’ve been on the founding team of two companies. One was called AvantGo, which was a very early pioneer in the mobile space back in the late 90s. It was a great, terrific company. Basically anyone who had a Palm Pilot or a Blackberry in those days had AvantGo on their device. And then I was the co-founder of a company called KACE Networks, a systems management software company which we grew from zero to about twenty million and sold to Dell. Within Dell we grew it over $100 million revenue. That’s kind of been my background in technology. After that, I got involved in investing with Toba Capital. Ander: What would you say throughout this entire process, until you arrived at Toba Capital, is your general marketing philosophy? How has it changed over all the years you’ve been doing this? Rob: I guess in a nutshell, I’d call it your reverence. I think that you have to grab people’s attention in some way and I think people generally take too conservative a route with their marketing strategy. I always try to do something that’s new, that hasn’t been done or thought about before. That’s generally what I look for in marketing, how I think about marketing. I guess I would bookend that with saying that marketing is also something that you have to do every day. You have to have a drumbeat around marketing. So, I also believe in sort of more traditional concepts of marketing to, like getting up and doing it every day, and making sure that you’re in front of people and making noise every day as well. Ander: And a big part of that, from my perspective and the perspectives of many marketers as I’ve found, is the importance of having a really quality team behind all of your marketing efforts. Based upon what Saranya told me, having worked for you in the past at KACE, I hear you’ve got a real knack for building these really loyal marketing teams with a great culture and a great set of really talented people. I would personally, as well as the rest of our worldwide audience, love to hear how you are able to do that. What does that look like? What goes into it? Rob: There’s a lot of stuff that goes into that. Building great teams, whether it’s in marketing or any other organization, is something you learn over time as you try to grow teams and you make mistakes. And I’ve definitely made my fair share over time. Ander: As we all have. I think there are a couple of learnings there. One is at KACE we tried to hire very senior people right out of the gate who had deep experience, and we were maniacally crazy about interviewing these people and making sure we knew who we were getting. I’d try and really getting under the hoods as to how people built success in their career. I Think think is really important. I also spend a lot of time doing deep background checking to make sure that I’m not just getting sold a bill of goods, but that I really know who I’m hiring. I think that’s a step that a lot of people miss. If you miss that, you often miss things about chemistry or about how people are going to perform in a team that you’re not picking up in an interview when somebody is on their best behavior. That’s sort of all about selecting the right team and there’s a bunch of different elements to it. I think the secondary piece to that is how you get these teams to gel and be great together over time. There are at least a few different elements of this and it actually kind of rolls into how do you do great marketing, as well. But creating a great culture and creating a religion around why people are excited to come to work is about making work fun. That’s about making their interpersonal relationships with other employees fun. Too many times I’ve seen that people tend to want to point blame or figure out blame or start with the cause, even if it’s sort of subtle but a little bit below the surface. To me, cause is really a bad place to start the discussion. We are where we are. I don’t really care how we got there. Maybe I care later because I don’t want to make the same mistakes again, but right now what I care about is getting out of this. That’s really where you can create positive working relationships among different people. I think the last thing that is important in building great teams is being the type of leader that’s willing to walk in the same shoes of the people that you’re trying to lead. If that means that you’re running a company where people are making maybe below industry standard wage, you’ve got to be willing to make that sacrifice as well. If it’s an organization where you expect people to work extra hours on a weekend, they need to see you doing those sorts of things. Just treating people great in general and with respect the same way you’d want to be treated. Rob: When I started KACE, it was just two people: myself and a co-founder. When we left inside of Dell, I think there were close to seven hundred and fifty people in the organization, all around the world. You’re hitting on a question of time, scale, and geographic distribution. I think the only way to maintain great culture when you’re doing that is to really create what I’ll call a religion, or a fanaticism that transcends you as a founder. It’s really about the company. The concept of religion to me is important in marketing in general. You create a club that people want to be a part of at the end of the day. It’s really important in marketing and retaining great people and retaining great culture. Exactly how you hit that nerve, I think, depends on the people that you have in your company and the type of people you’re selling to. For example, in our world at KACE, we sold to IT professionals who were typically 30- to 45-year-old males and so we tried to create a culture as a company that they really related to and it got them super excited about being part of the company. That got our employees super excited being part of the company. Well, that’s one way to think about it but we used to throw our party in the middle of the week, on a Wednesday. We’d give everybody the day off of work, we’d go to the beach, have a barbecue, and we’d invite everybody’s families. Ander: Sounds like a great place to work. Rob: Yeah, I mean, we’d do stuff like that. Another example was – and this is maybe a secret I haven’t let out of the bag fully – I used to run the whole company on one credit card. We got a ton of mileage, a ton of points, and I would give gifts to people all the time in lieu of a cash bonus. Rob: It’s those sorts of things that I think create a lot of loyalty and excitement in a company. Ander: I imagine that thinking also translates into how you communicate with your personas and your perspective users or whatever you want to call them. Ander: How important is it to hire people for your marketing organization that are your target users and that really reflect who your personas are? Rob: That depends on what you’re marketing. In my situation, when I was selling KACE systems management products, I don’t think it mattered at all. I think it mattered that people were fun and lively and willing to engage in the type of marketing that we wanted to do, but I don’t think it mattered that much. Another type of product might be different. For example we’re an investor in a company called Trace which makes a sports tracking device that they use on surfboards and snowboards and things like that. In that case, it’s a little bit better to have a marketer who understands surfing or X-games type of culture because they might get someone like me who just doesn’t even know how to speak to that audience. However, that’s a fairly specialized consumer audience compared to B2B marketing. Maybe in a consumer marketing sense, it does make a big difference to really understand and live that persona. When it’s more of a B2B marketing world, I think it’s just an ability to get your head around that persona, which is a little bit easier, for me at least, because it’s easier to relate to a 40-something IT guy than it is to relate to somebody who’s surfer or something like that, which is not a sport that I’ve participated in recently. Ander: Right. That’s like working at an internet radio or music streaming company when you don’t really care about listening to music. Ander: If you’re going to be building this product, you should probably at least be someone who’s going to use it, you know? And so they were putting in all these features into the product that didn’t makes sense. It’s like… Have you ever used iTunes? Ander: But that’s a different story. Rob: Well, yeah, I think that makes sense too. But there’s a fine line. I’ve heard of people that oversteer towards that where everyone in the company has done that thing before or participates in that activity or is that persona. You can’t always create that, but sometimes you can. It’s probably just different ways to run things. In fact, I’m an investor right now in a company called FloQast which, from my perspective, is one of my most exciting companies. They make software that helps companies close the books faster and more accurately. Part of their tagline is ‘Built by accountants for accountants,’ and they’ve done a good job of make it so two-thirds of their employees have an accounting background. I don’t know the exact numbers and that’s just a guess. But they also have this kind of fun, playful, marketing, grow a company, high tech background too, so maybe bringing those two things together is pretty special. Ander: Totally agree. On that note, let’s shift gears towards what you’re doing now, towards your work as a VC, as an investor, and an advisor. When you’re looking at companies to possibly invest in, how do you choose what to invest in? What do you look at, especially from a marketing perspective? What do you specifically have your eyes on – for what they’re doing or what you think they should be doing? Rob: Well, I’m two or three years into being a VC so I’m not going to claim that I’m the greatest venture capitalist at this point. It definitely takes years if not decades to figure out whether you’re any good at something in this particular line of work because it takes that long to find out what the results are. Rob: But I would say in evaluating a new investment, I look for a few things. First, I look for relatability. Do I relate to the idea and understand it? If I don’t, it makes it a lot harder for me to dig in and do the diligence that I need to do in order to validate whether it’s a real opportunity. e In the world at FloQast, once I had something that I related to, I had a lot of challenges in managing the close process of our financial process, both as a stand-alone company and once we were a division inside of Dell, there’s just a lot to do, so I really understood what they were trying to solve and I didn’t see any other companies in the market solving it. It was a first-person problem for me. But once I have something that I relate to, then I do the same thing I do when I look for a new employee, which is go out and validate it in the market. With an employee, you’re out basically doing a blind reference check. When you’re doing a validation on a new market opportunity for a company you’re investing in, like FloQast, I’ll show it to five or six or ten CFO friends of mine and try to get feedback as to whether I think this product’s going to fly. In the case of FloQast, I had probably the highest amplitude of positive feedback for any company that I’ve invested in so far, and so it was kind of an easy investment for us. Beyond that, you’re looking for great founders, you’re looking for good energy, and you’re looking for repeated predictable success. Someone in my career once fairly early on taught me that the actual results matter to a degree, but it’s almost more important that you understand where you’re going. So, if you say you’re going to have a good quarter represented by some certain number, that you actually hit that number. Or if you think you’re going to have a bad quarter and you call it early, at least it demonstrates that you understand the business. From there you can make positive change as needed. You’ve really got to understand what’s going on. On the marketing side, I look for customer fanaticism. And I think that’s something that is often intrinsic to the product but it’s also intrinsic to marketing. What I mean by that is you can create momentum around customer excitement in different ways. There has to be native excitement about the product. Customers have to like the product but you can create that in different ways. For example, you’re using a Mac to record this interview today. One of the most startling things I ever heard about a Mac is one of my friends posted on Facebook, ‘I can’t get X, Y, Z feature to work on my new Mac. It must be me.’ And he went off to the Apple store to get help. And even though that is often the case with an iPhone or a Mac or at least probably just as prevalent with any other type of device or software, they’ve done a good job of convincing people that they have the easiest to use platform and therefore if there’s a problem, customers immediately point to themselves, not to the company as being the problem. There’s marketing that goes into that. That’s deliberate. It’s not accidental in most cases. Rob: So ‘Saving you time and saving the company money’ became part of our persona. Now, that’s interesting and you can market that in a lot of different ways. We went to our user conference one year and we gave a video camera to a guy and said we want you to go ask every customer you can get in front of: ‘How did the KACE application help save you time and your company money?’ We just put a camera in people’s faces and had them answer that question. Rob: If you just went to those same 500 people and ask why they love their Kbox, you’re going to get 500 different answers. That creates a huge different amplitude in the way you can use that material and market yourself. If you have 500 people responding to the same question in the same way with the same parallel syntax, it creates a much more powerful verbal overlay in video that you can use all around your company versus 500 different answers. They might all may be great reasons why people loved your product but they’re not all on point. You have to be on point. Ander: Yeah. On a related note, that’s actually very interesting in terms of personalization. One of the things that we really talk about at Instapage is creating a personalized marketing experience with post-click landing pages as the lowest hanging fruit to create that level of personalization. Rob: We have probably forty investments inside of Toba Capital but we’ve probably seen hundreds because we evaluate companies all along the way. And, when you see a smart marketing team or a smart sales team and they’re talking about hyper-targeted and one-to-one marketing, I think that perks everybody’s ears up. When they can put a little meat on the bones and tell you how they’re doing and show you how they’re doing it, that just shows us that they’ve got a buttoned-up shop. That’s appealing in some ways. But I do think, you know, if you ask me the question a little bit differently, like ‘What do you think the biggest trends in marketing are?’ I think that pretty clearly one-to-one type of marketing is probably one of the biggest things out there and account based marketing kind of leads the way around that. For example, how is a particular account going to respond to a particular marketing message? I think those things are very, very important. I think the other trend you’ll see a lot of is people trying to talk about attribution. What’s generating returns for me on the marketing side? Both of those are very important but I think what they both miss to a degree is the importance of what I was talking about before, one of them being the importance of being on point. I think you have to have a message that can be custom-tailored but it has to be on point in the sense that it’s repeated consistently, all the time to every customer in a way that customers will respond to. Rob: Yeah, I just don’t think there’s that much power in jumping all over the place too much. But that’s different from one-to-one. You can be on point and one-to-one. I think you have to be both of those things. I think the other piece is you have to grab people’s attention in a way that’s often times irreverent or unique or in some way stands out from everybody else. If you just sort of swim in the normal lane of normal marketing I think people forget that there’s the art of marketing. Ander: That’s another thing that is also a big part of what we think about at Instapage, is brand consistency – especially when it comes to loyalty and evangelism in the best case scenario. Rob: I think I know where you’re going… Let me give you an example of a way that you could deliver one-to-one marketing but you could also be on point. For example, you might decide that you have a ‘save time, save money’ value proposition and so you’re talking about the ROI that your product generates for a particular type of customer. While you might segment that further and say, you know, ‘Pharmaceutical companies like you generate a 2x return on their investment.’ That’s a little bit different than saying that companies overall generate a 2x return on their investment. So if you’re going to a post-click landing page that talks about return on investment, it’d be nice if you just pitched the customer on the return to pharmaceutical companies, and the case study, the video, and the ROI study that they get to is all right on point with their industry. That’s an example of a little bit more of a one-to-one nature for something that’s also specifically on point to how you want to market. Ander: That’s really, really cool. And again, lines up with so much of what we write about and a lot of the content that I create at Instapage, as well as a lot of the other marketing influencers and advertising influencers that I speak with. Is there also a specific metric or KPI that you’re especially sensitive to as in investor, whether it’s ARR or churn or something else? Rob: Well, I think there’s a lot of different ones that we track and you could do all kinds of reading on that to look at different ones. One of the things that we pay special attention to would be momentum around ARR. It’s not just what your ARR was every year but instead looking at the net new ARR this quarter versus last quarter versus the quarter before. Specifically, we’re looking at how much capacity in net new ARR you’re able to add. Intrinsic in net new ARR is also a churn concept because basically it’s looking at what is net new? It’s new minus what you’ve churned. I think those are the things at a top level that we look at. Companies don’t often do net promoter score analyses but when we see a credible analysis for that promoter score, that’s also pretty compelling and we get excited also when we see it. So I look for predictability in the business. I like to know what did you forecast for the last three-quarters and how close did you get to hitting those numbers? If I have a predictable, reliable business, then I know I’m putting my money behind something that I understand and that I can expect, even though past performance is not always a predictor of future results, at least I know I’m dealing with a solid foundation to start with. Ander: And all of this thinking obviously, I imagine, applies to the companies that you are on the board of right now. Ander: What are some of the learnings that you had in your two to three years as an investor and on the boards of these organizations? Rob: Well, there’s so many of them. It’s hard to zero in on just a few but let me try to. I guess one is really just to rehash what we just said, which is the predictability. When companies understand their business and tell me what they’re going to do and perform on what they said they were going to do, that’s always a very, very good sign because if things are going great, that’s great. If they’re going poorly, they understand how to fix them in most cases. Conversely, when you don’t see predictability, that’s something to get really concerned about. That’s kind of the first order of business. Another thing that I wanted to cover is when you’re sitting on a board and you hear about a subtle problem, something that’s just starting to creep into the psychology of the CEO or the VP of Marketing or whatever, it usually is always important to dig on it earlier rather than later. I think too many times we would look at something and say, ‘Well this is an early problem. We’re really not sure if it’s a problem yet at all. Let’s review this at the next board meeting.’ And almost always, it ends up being a bigger problem than we gave it credit for at the outset. Some of my regrets as a board member relate to not seizing on the opportunity to dig deeper on some of these bigger problems earlier. Ander: Wow that’s very useful. What would you say for founders and entrepreneurs who you are working with as a board member, what are some important things for them to keep in mind when working with you as an investor? Or just investors in general? Rob: If you’re close to the venture community or you’ve been a CEO for a tech company you’ll probably understand these but I’ll throw them out there for those who might be new to it or contemplating starting a new company. And actually, some of these things apply if you’re just a VP of Marketing somewhere or a Marketing Manager or something like that. There shouldn’t be surprises – whether they’re upside surprises or downside surprises. Transparency, quick communication, and not taking it personally is really important. If you’re going into a board meeting, you don’t walk to walk in and drop a bomb that says I just missed the quarter by 25%. You should have laid the groundwork well before that, to let someone know that you have concerns. I think number one in working with me or with anybody else is to not be surprised by things. Another one, particularly in dealing with me, is that I like to let CEOs run the business. That’s what they’re hired to do, they’re often times founders and I want to give them a lot of credit for the great work they’re doing, and the fact that they’ve taken a big life risk to start something. It’s their baby – they should be running it. On the flip side, if you surround yourself with great board members and investors, we frequently have great experiences that we can bring to the table. Finding that inner change and level of trust between a founder and a board or an investor is really important. I’ve taken the attitude that it’s going to take a little bit of time for me to develop that level of rapport. I have to show good diligence of giving people good feedback and not being in their face too much while still being constructive and helpful and letting that relationship mature at kind of a normal, organic rate. I think that the quicker you can get to that level of trust with your investor or your advisor or your employee, specifically trust that is built on a foundation in which you have respect for the work that that person does, the quicker you can benefit from the advice that they’re giving you. I’ve found more often than not, with founders it takes a while to develop because VCs tend to have a little bit more of a negative sort of persona with the people they’ve invested in. They’re kind of known as vultures or sharks or whatever, so there tends to be this divide that needs to get crossed and bridge that needs to get built. Rob: Like, one through seven, how would you order rank them in terms of their performance? That doesn’t mean that the 7th rated person stinks at their job. It just means that they’re 7th on a list. And if they’re 7th on a list, there’s a reason for that. If you can dig into what that reason is and be open-minded about it, then you can communicate with that person better. Sometimes it means that they aren’t effective at their job and they need to be gone. Other times it means that someone needs to point out here’s where you could be better and often times great people respond to that and become better at their job. Rob, we’ve talked about many different themes throughout the course of this conversation. We’ve talked about predictability. We’ve talked about creating the culture and really creating a positive, friendly, honest relationship with all of the people that you’re working with including those who are under you, your investors, your CEO, etc. Where is all of this going? What do you kind of see on a high level as the future of marketing and the future of how companies are going to break through the noise? Rob: I think that the more things change, the more they stay the same. You know? I think somebody who was the top marketer in 1950 in the world would probably be the top marketer in the world today because you can surround yourself with process and tools and one-to-one marketing systems or whatever you want to use from a marketing automation standpoint and whatever the latest tool might be for reaching an audience. Those are sort of tools of the trade but they’re not what make great marketing. What makes great marketing is personality. It’s charisma. It’s touching a nerve, and creating a religion… I think that’s what’s going to make great marketing in the future. You have different tools at your disposal but if you forget that marketing’s about a human touch point and hitting that nerve, I think you’ll never be a truly extraordinary marketer. Ander: It sounds like what you’re saying, or at least how I’m interpreting what you’re saying, is to never forget about the qualitative components of what you’re doing. Despite all of the data we have at our disposal to make very informed decisions, there are these narratives and storytelling components that we really do need to hold onto, even as we move forward with artificial intelligence and machine learning and other technical improvements. I think those are important questions to ask from a directional standpoint to determine whether you’re making progress versus falling behind relative to the prior year. But they really don’t mean much because a lot of the best things you can do in marketing are not attributable. Coming up with the best on point message, coming up with where you can hit a nerve in a unique way, and coming up with ways to make your product and service a religion within your customer base, are all things that are cult of personality and are driven by great personalities and great narratives. That’s not about a dollar for dollar return. Those things done properly create a multiple on everything you’re doing and so whatever the more modern tool of the day is that you might be using, that’s going to amplify the success of that product. But that product won’t be successful without that right narrative and I’m sure that’s true what you guys see with your own products. Rob: If people can buy your product and initially the ROI is zero because you’ve got to load it with the right message and I bet if you guys analyzed the customers who are engaged with your product, you’ve got people who are A+ users of your product and you’ve got people who are B- users of your product. And I bet more often than not the difference is in the narrative and the storytelling and the cult of personality that those great marketing people are creating within their employee base and within their customer base. Ander: I completely agree with you. And I’m going to guess that members of our worldwide listening audience of all-star marketers agree with you and are internalizing a lot of that as well. On that note Rob, it has been an absolute pleasure coming here to your really, again, incredible home office in Menlo Park, right across the street from Stanford. We’re pretty close. Ander: Rob, we like to ask people who come on the podcast, we like to ask our guests if there’s anything that we as a marketing community can do for you or the rest of the marketing community as a whole. How can we help you and Toba Capital? Ander: Excellent. Rob, once again, thank you so much and we’ll talk to you soon.